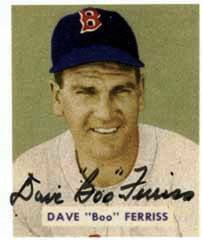 Dave “Boo” Ferriss, an ex-G.I. discharged from the Army Air Corps in February 1945, began his major-league career with an astonishing eight consecutive wins for the Boston Red Sox in 1945. His achievement was even more remarkable given that he had only one season in the minor leagues before becoming a major leaguer. In his debut, Ferriss shut out the Philadelphia Athletics on April 29. Ferriss made his second start seven days later, in the first game of a Sunday doubleheader on a rainy, overcast day against the New York Yankees on May 6 at Boston’s Fenway Park. The Yankees’ starter was Ernest “Tiny” Bonham. The day before, in the first game of the series, the Boston Red Sox had suffered their ninth loss of the season, 7-3. The Boston Globe wrote of Ferriss’s 5-0 second consecutive shutout that “the Yankees, like the Nazis and Japs, learned that ‘Nothing can stop the Army Air Corps.’”1 After serving in the Army Air Force for 26 months, the 6-foot-2 right-handed pitcher had been discharged earlier in the year because of a bad case of asthma. Ferriss retired the Yankees in order in the first inning. It was a much better start than his debut, when he walked the first three batters and threw a wild pitch before getting out of the jam without surrendering a run. However, in the Yankees’ second, Ferriss loaded the bases after getting two outs by surrendering a single to Frankie Crosetti, a double to Oscar Grimes, and a walk to Mike Garbark. He got out of the scrape when pitcher Bonham’s roller down the third base line struck baserunner Grimes for an automatic out. The Red Sox scored on an odd play in the bottom of the fourth inning. With George Metkovich on third base, catcher Garbark caught a foul popup near the Yankees dugout. No one was covering home plate, and Metkovich came home. Working through the bleak weather, Ferriss yielded hits in the fourth, fifth, sixth, and ninth innings, but the Yankees never really threatened after the second. With two outs in the ninth, the game was interrupted by a 47-minute rain delay. However, the game was resumed and Ferriss returned to the mound to clinch his scoreless outing.2 He struck out four and walked five. The Red Sox scored twice in each of the sixth and seventh innings, including a solo home run by Bob Johnson in the sixth. Ferriss scored a run in the seventh. For the game, he collected two hits and a walk, following his perfect 3-for-3 performance in his debut game against the A’s a week earlier. Bonham took the loss for the Yankees, exiting the game after six innings. He gave up three earned runs on 10 hits, walking none. Ferriss had literally come out of nowhere to gain national attention for his first two unexpected wins. His only previous professional experience came in 1942 when he pitched 130 innings for Class B Greensboro, although he did play on service teams while in the Army. The win was Ferriss’s only victory over the Yankees in 1945. After his eight victories, his first loss came at the hands of the Yankees on June 10. He faced New York four more times and lost all four games. Overall, Ferriss won 21 games for the seventh-place Red Sox. In 1946, his sophomore season, Ferriss won four of five decisions over the Yankees. Was Ferriss’s success in 1945 due in large part to his having faced weak lineups shorn of the best players by the military draft? That is debatable, especially since Ferriss won 25 games in 1946, when, with World War II over, rosters returned to normal. Ferriss led American League pitchers with a won-lost percentage of .806 as the Red Sox won their first pennant since 1918. After two sparkling seasons, Ferriss’s career was cut short by an arm injury suffered during the 1947 season. He made only nine-major league starts from 1948 to 1950. After retiring as a player, he was the pitching coach for the Red Sox from 1955 to 1959. Despite his shortened career, he was elected to the Boston Red Sox Hall of Fame in 2002. Cleveland, Rick. Boo: A Life in Baseball, Well-Lived (Battle Ground, Washington: Pediment Publishing, 2008). 1 Hy Hurwitz, “Sox, Yanks Swap Shutouts,” Boston Globe, May 7, 1945, 14. 3 Red Smith, “Ex G.I. Proves to A.L. He Knows Hill ABCs,” The Sporting News, May 10, 1945, 10.